Beautifully engraved certificate from the T. Eaton Company Limited issued in 1999. 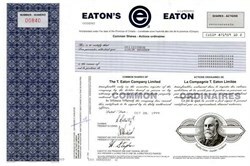 This historic document was printed by British American Bank Note Inc. and has a block border with a vignette of the company logo and a portrait of Timothy Eaton. This item has the printed signatures of the Company's Officers. 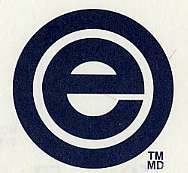 Timothy Eaton was the founder of the large all-Canadian department store chain bearing his name. It began as a small dry goods business in Toronto in 1869. By his death in 1907, he had built up a giant retail store in Ontario�s capital city along with a country-wide mail-order business and a big new branch store in Winnipeg, the first of many such �T. Eaton Company� business establishments that, in time, would spread all across Canada.